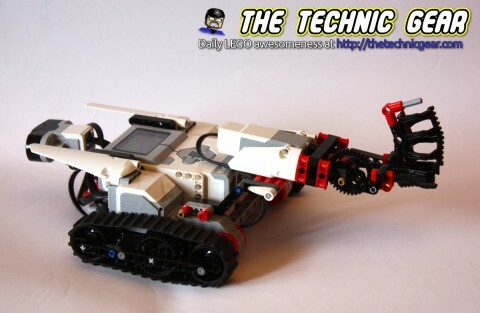 Today, I review the first robot of the new LEGO Mindstorms EV3: Track3r. I think LEGO has replace e for 3 in a hope to make their models look cooler which I think it is plainly stupid as they are already cool enough… but well… LEGO does, I build. Here is the robot. 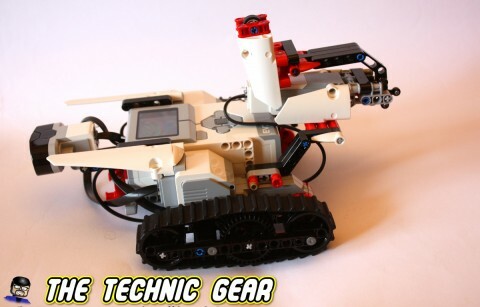 Tracker is a small robot with uses the different sensors the Mindstorms EV3 comes with, all but the touch sensor. 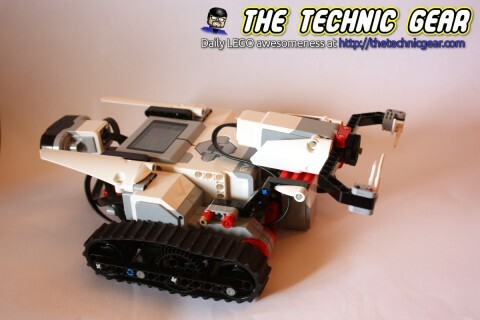 It features a tracked base using both L-motors that attach at the sides of the NXT Brick. It has also a IR sensor on the back of the robot ( or the front, still not really sure ) as well as a set of tools that are build using the M-motor and that are easy to replace. So let’s review the different stages. 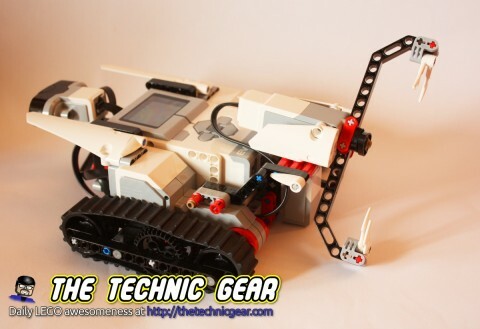 For the first model there is a printed manual on the LEGO Mindstorms EV3 box that let you build it. It isn’t a challenge at all and the building process is quite straight forward. And then, once you are done you are on your own… well, not really. 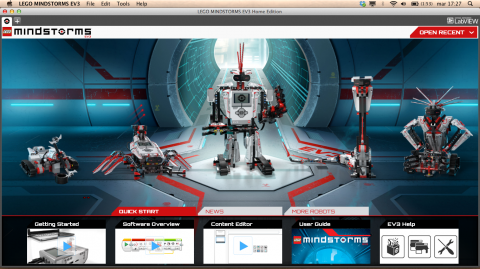 You are supposed to download the new LEGO Mindstorms software and install it. Once you open it you will see this screen. 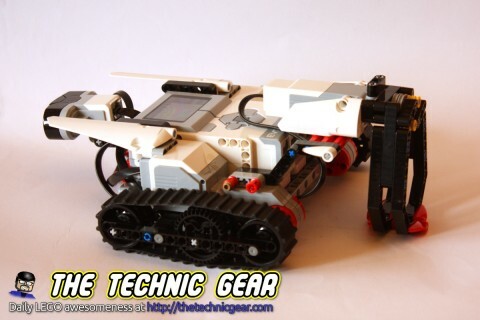 Choose the Track3r robot and follow me in the review. The goal on this mission is to remove a tire from the mission pad. This mission show you how to control both L-motors and M-motor, so basically the task is about completing the robot and coding an small program that makes the robot move forward and then turns two rotations its M-motor. As you see it is a quite simple program with a block to move B+C motors first forward, then move the A motor two complete rotations and finally move B+C backwards. If your robot doesn’t move the problem can be that the batteries are empty ( I have suffered this one more than once ) and or that you didn’t connected the cables from motors to brick in the correct way. Refer to the instructions book and fix it. If it is something serious you perhaps miscoded the robot. Make sure you set both motors at the same speed or use the new Tracked Vehicle box on the EV3 software. If it is something small it may be related to the fact that each motor can be slightly different so one track may move slightly faster than the other. You can try to correct this by software because the alternative is to rebuild it in a different way. If it goes a bit to the left just make the left track moves slightly faster, just 1%-2$ more. Most of times it does the trick. Again, the problem may be related to not connecting the cable correctly or to the fact that you may have forgotten to add the block that operates the M-motor. Just making it perform two complete rotations is enough to take the tire out. Do you have another problem? Drop me a line on the comments and let me help you. You can now remove the blender from the front ( or back ) of your robot. But you don’t need to take it apart, the rest of tools can be built with the remaining parts. This time we are going to build a ball launcher for our robot to hit tires places at two given places of our mission pad. So basically we need to build a ball launcher that it is similar to the new available at Mindstorms NXT 2.0. It is pretty interesting how the big gear is used to move the axle that push the ball out. Here is a video of the model working. The problem with this program if you want to build it yourself is just to measure the angle the robot needs to turn and then move left, shoot, move right twice the distance and shoot again. Checked the batteries? Are the cables connected? Did you add the block to turn the tracked vehicle? Sounds really strange. I would double check the cables. You can do the math here or you can just find it using try and error. The problem is that you need to turn your robot just x degrees to align the tires heap. Oh, I have had this one too. First of all rule out the simple causes. Check cables. Are they balls in the shooter? Is there any ball on the shooter that block the rest? In my case the gear where the axle that push the ball out is connected was placed in such a way that a single rotation sometimes didn’t shoot a ball. So try adding more than one rotation ( two for example ) to make sure something came out of the robot’s gun. So we remove the ball shooter and build the next accessory that it is something similar to a claw. We will use this claw to grab tires from the mission pad and place them on special designated areas. This is the first tool that really caught my attentions. The Claw is really cool and it is very nice the way it has been designed. Here you have another example of measuring. In this case you need to measure how many rotations you need to get to the first wheel, how much to turn to be over the pad area designated to drop the wheel and then the same thing for the next wheel. Then Track3r returns to the mission pad’s starting point. So let’s view the program. The first M-motor block opens the claw and then the loop is a task that it is repeated twice: Move forward, two rotations, close claw, do a sound, move forward slightly to the right, open the claw and move backward slightly to the right again. The final block moves the robot to the mission pad’s entry point. Is the M-motor correctly plugged? Make sure that you are not rotating the motor in the wrong direction. As in the previous mission it is all a matter of measuring the distances and angles. You either do the math or you just find them by try and error. In this mission you have some interesting things like the IR Sensor. You have to build a tool that looks very much like a hammer and you will use it to crush the hands that dare get near your Track3r back. The hammer is easy to build, just make sure you add the rubber bands or you will end up with a few broken LEGO bricks. This program is the first that really needs a loop, and you have two in fact. It is a bit big but it isn’t very complex. The first M-motor block moves the Hammer back and then the real loop begins. As you can see on the right side of the screen the loops runs forever. So next thing inside the loop is a comparison using the IR Sensor distance check. If there is anything below 25cm it will execute the upper branch on any other case it will execute the lower branch. The upper branch, shows an image on the screen, rotates 360º, that is 1000 degrees of the motors B+C, then moves the M-motor as fast as possible foward for 0.3 seconds, laugh and move it back. The lower branch on the other hand coded the behaviour for patrolling and moving a bit, just a bit, the hammer. Is it correctly plugged? Did you code the L-motor block to turn? Make sure the M-motor is still plug and that there is nothing in the big gears that are supposes to launch the hammer forward. Is the IR sensor plugged? Did you coded the behaviour about what to do when detecting an object near the back of the robot? In this mission, you will command TRACK3R with the Infrared Beacon to pass through all the checkpoints on the Mission Pad before time runs out! When you complete the task you will get a score. Well, there is nothing to build here but this is perhaps the most fun use of the brick I have seen. LEGO has created a block that does the score count and the time checks. Personally, I didn’t even tried to write the code as it is quite big. This program is a great example of parallel execution as you have several task running at the same time. The second thread is the one that stop the blender when you step on a red line and make the alarm goes. Finally the third thread is the one that keeps track of each color you scanned and finally decide if you did it or if the time ran out. 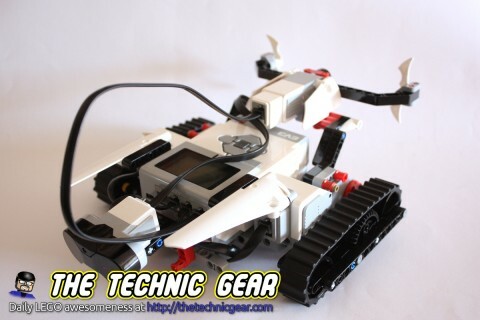 So here is my review of the first LEGO Mindstorms EV3 model: Track3r. Although several of the first missions are a complete lose of time missions 04 and 05 are really cool. Personally I think the first missions are too scripted. What happens if i do not add the rubber bands? My TRACK3R dosen’t work on the time trial, i have double checked everything, replaced the battries, but nothing happens.